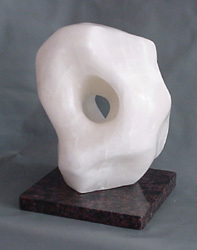 9"d x 12"w x 13"t, Base: 10" x 10"
Ptolmey 1 is one of the Tranquil Series of Sculptures. 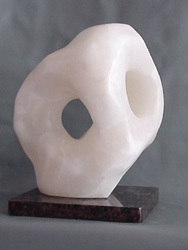 It joins other sculptures that include: Cherish, Embrace, Kanryuu, Ookawa, Secure, Stillness, Taihei 1, and Taihei 2. 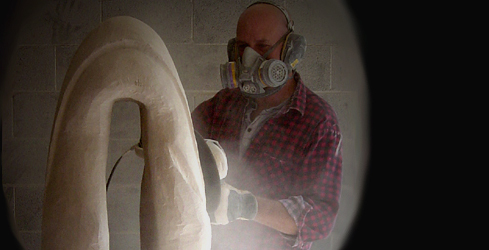 Ptolmey 1 is a restful sculpture and also has a special quality. Ptolmey 1 causes you to slow down to appreciate it. It's delicate color contrasts with the blockiness of the design. Ptolmey 1 undulates back and forth, in and out and slowly seems to move in front of your eyes. 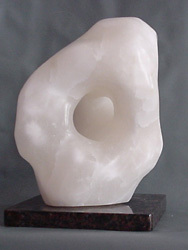 The special quality that it has is that the Italian Alabaster is semi-translucent. When light is put behind it, it radiates a sunny glow. Secure shares the same translucent quality.